Bruce have listened to the aggregates recycling industry as, with space at a premium and an increase in demand to produce quality concrete aggregates, many producers are turning to washing secondary, recycled materials to manufacture sized gravel and sand products. 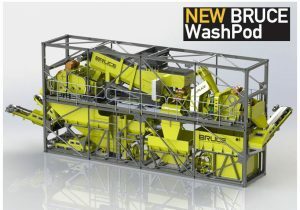 With the introduction of the New WashPod, Aggregate Scrubbing, Trash Removal, Aggregate Rinsing/Sizing & Sand Production are all on one simple chasis, compatible with any mobile screen or crusher. Capital Outlay- Often, traditional aggregate washplants have purchase budget costs measured in millions which, even for directors of established companies can be viewed as a risk too far to introduce a new and some cases experimental process. Now, the decision to move into aggregate washing is not so substantial. Static Nature of Plant- Even with existing so called “mobile” or “modular” systems set up times can commonly run into weeks and when they are installed they require considerable site input in terms of civil engineering and planning compliance. The reverse is true as well – once the plant is in and running it is a huge upheaval to move it to another location. The WashPod only requires two standard twist lock trailers to be mobile. Size of Plant-In many cases companies simply haven’t had the room to consider washing. With footprint of a shipping container, excluding ancillary equipment The WashPod opens up the possibility to most sites. 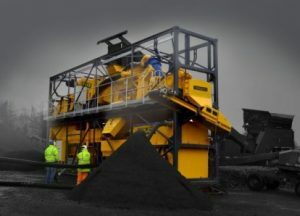 Complexity of Operation- Using The WashPod production of two aggregates and one or two sand products has been made simple with a clear and accessible operator interface. With plug and play operation, easy transport options, and compatibility with Bruce’s range of silt management solutions your company could be self-sufficient in concrete aggregates in the very near future.